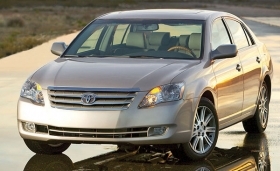 Toyota will repair more than 1 million vehicles worldwide, including the Avalon. TOKYO (Bloomberg) -- Toyota Motor Corp., the world's biggest carmaker, will recall 1.53 million vehicles globally to fix a brake-related problem that may cause fluid leaks. Toyota will repair 599,029 cars in Japan and 740,000 units in the United States, the company said Thursday. In some cases, a small amount of brake fluid can leak from the brake master cylinder and as a result, braking performance may gradually decline, Toyota said. Models recalled in the United States include the Avalon, Highlander Lexus GS300, Lexus IS250 and Lexus IS350. Toyota will also recall vehicles at joint ventures in China, the General Administration of Quality Supervision, Inspection and Quarantine said on its Web site. Thursday's announcements come as the world's biggest carmaker is seeking to regain customer trust and market share after recalling more than 8 million vehicles globally for defects linked to unintended acceleration. The Japanese company has added 40 engineers and created teams to scrutinize the designs of components, according to the company and an outside consultant. No accidents were reported from the defects, Toyota said. Toyota does not disclose estimates for recall costs, and had no comment on whether the repairs would have any effect on its earnings. Toyota has blamed at least part of the quality slip over the past year on its rapid expansion during the past decade, when it overtook General Motors Co. as the world's top-selling automaker. Toyota's shares, which have grown largely immune to recall news, ended up 0.4 percent at 2,900 yen in Tokyo. Other Japanese automakers' shares and the broader market fell on Thursday.